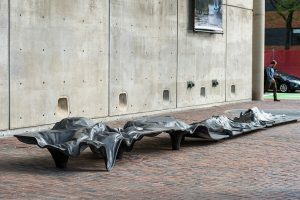 The installation outside Gund Hall responds to real-time data, ranging from emojis used on social media to police radio dispatches. 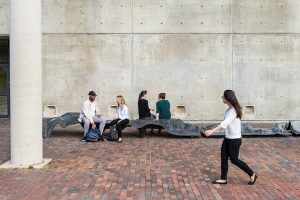 As visitors to the Graduate School of Design’s (GSD) Gund Hall approach the puzzling blanket of concrete installed by the Quincy Street entrance this semester, the mound — or is it a bench? — buzzes and throbs. 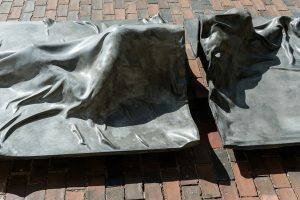 Titled “PULSUS,” the enigmatic piece is described by its designer as a form of “perceptual artificial intelligence.” It gathers real-time data on city activity, such as traffic patterns and what residents are doing and feeling, from various sources and translates the information into soundscapes. 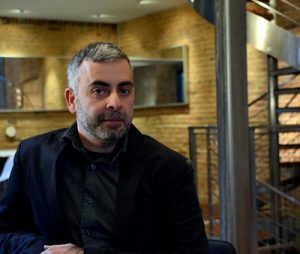 Allen Sayegh, associate professor in practice of architectural technology, spoke with the GSD about his installation and what it might signal in a world increasingly invested in artificial intelligence. GSD: From the visitor’s perspective, you see this structure and you sense that it’s communicating in some way, or at least buzzing and pulsing. Where are these signals coming from? SAYEGH: “PULSUS” gathers data from different sources — real-time police conversations, tweets from around the community, among others — and then translates these into different types of tonal sounds, producing the buzzing that you can hear and feel when you’re close to it. When we had it in SoHo in New York over the summer, it also sent out bursts of mist to cool off visitors. To create these effects, we’re drawing from different types of tweets that are geo-tagged around the city. We’re looking at language, especially the emojis that are being used, which we quantify with different values, which then are coded to produce sounds. We wanted to generate an experience that resonates on an emotional ground level. The process has been very much a blend between analyzing quantitative data and designing an experience. And at the end, the resulting piece acts essentially as a conch shell for urban activity, or as a stethoscope: a new way to listen in to the city’s activity, and a concrete interface with a feedback system that is almost like a musical instrument. There are different metaphors people have been using to describe it, but the idea is to sense the pulse of the city. 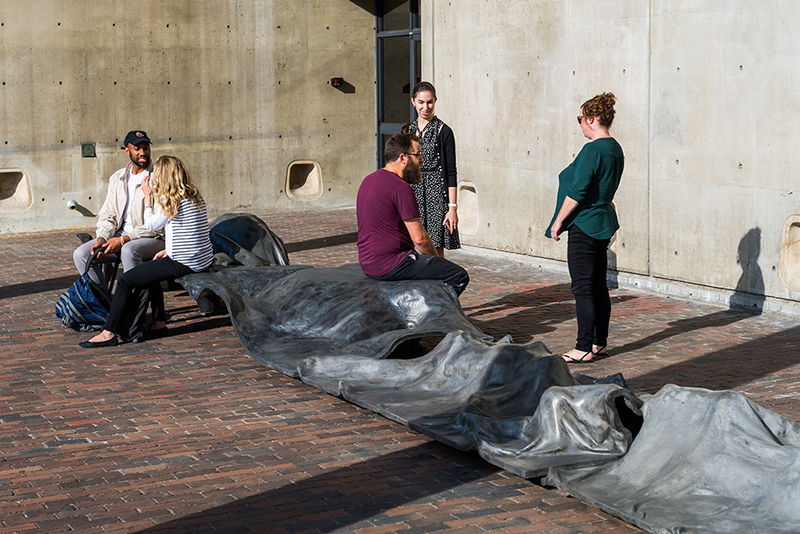 The installation becomes a gathering spot. GSD: What fueled the idea of taking real-time urban data and translating it into a very physical, sensory experience like this? SAYEGH: Today, there are all sorts of conversations about data, big data, artificial intelligence, machine learning, and how data and cities are merging and becoming reliant on each other. With “PULSUS,” I wanted to go with something more playful, like the idea of putting an ear on the city and simply listening to its pulse. GSD: Looking at the physical object, “PULSUS” has different curves and undulations carved into its concrete form. What is the shape of these curves, and the overall project, meant to signify? 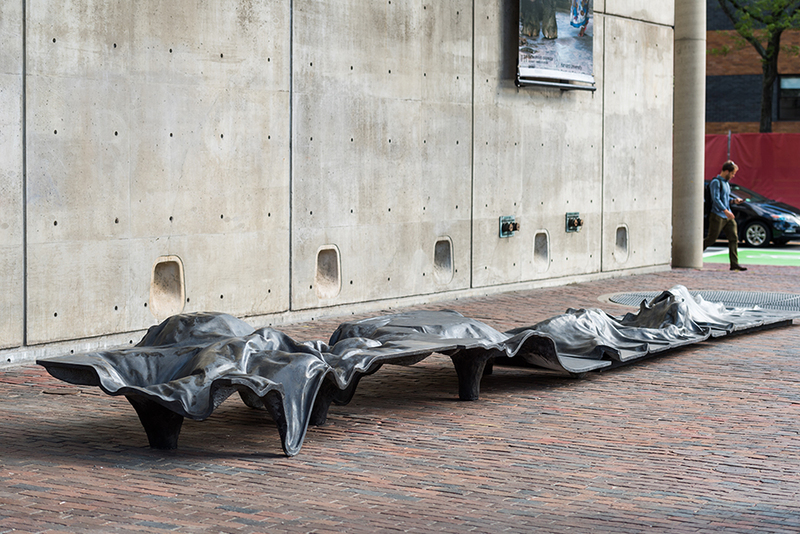 SAYEGH: Referring back to the concept of human scale, all of the curves and undulations in “PULSUS” are literal translations of the human body. There are positive and negative imprints of seven human bodies. 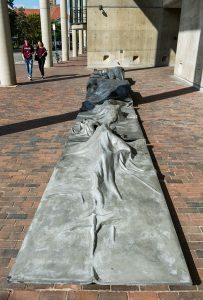 It almost looks like a concrete blanket draped over somebody. 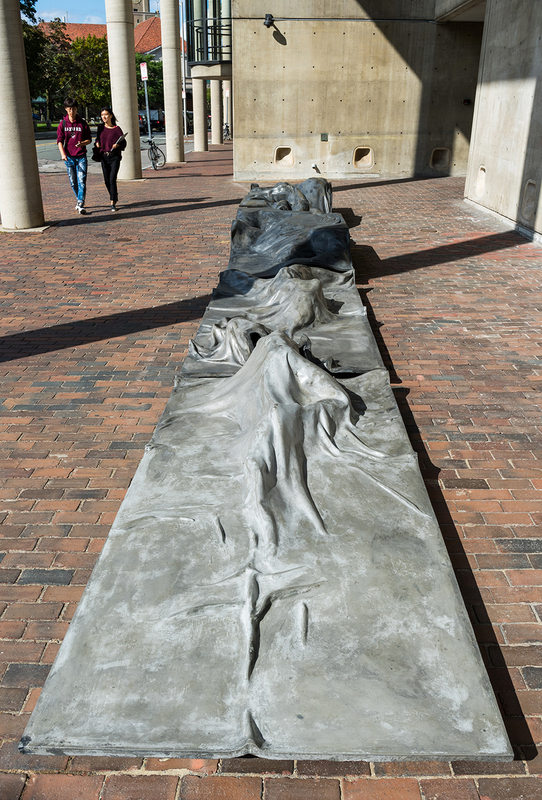 So that’s part of the physical element here, how we worked with the idea of the physical form with the intention of evoking considerations on the human scale and human body. It encourages you to feel and think very literally about the human body and scale while the energy and rhythm of an entire city is pulsing beside you. GSD: In a sense “PULSUS” is like a new sort of map. We’re so used to seeing data, especially about regions or a city, being represented visually but two-dimensionally, in a map or an atlas. Would you in any way compare “PULSUS” to a map? SAYEGH: Yes and no. On one level it is a representation, but it’s more than just a visual reference. It’s a performance, something you sense and feel with the body. GSD: When you look at the actual, physical installation, it’s made out of concrete, which can represent many things in this context: the idea of the “concrete jungle,” cities and buildings made out of concrete, concrete plans, concrete ideas; you mentioned earlier the idea of a musical instrument with a concrete interface. What was the design process like from conception to production, and why concrete? SAYEGH: We were thinking, first, of the city and its concrete. Concrete is very versatile. It’s very durable yet very malleable. The sound qualities of concrete are very rich. So as a material it has a lot of interesting qualities. 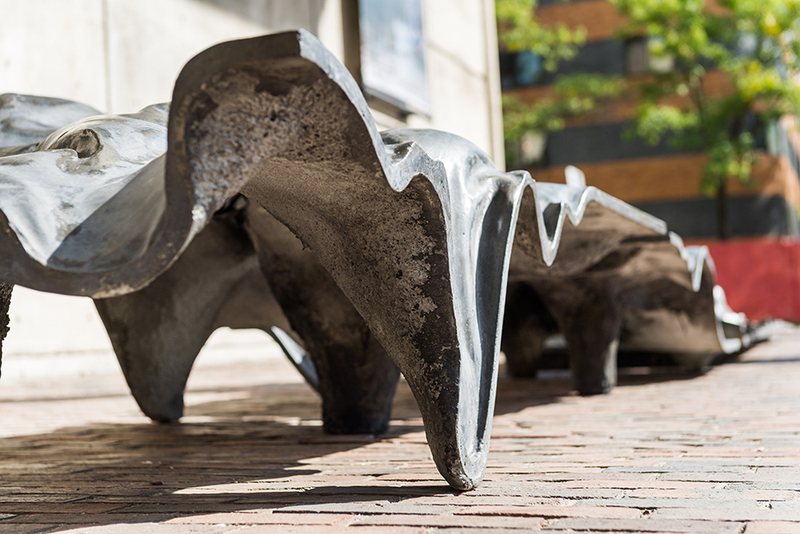 Part of the challenge of this hybrid sculpture or bench was to really push the limits of what we can do with the material physically and as well at the intersection of the physical and the digital, which is where “PULSUS” falls. And from there, we experimented with how we can add data interpretation to this intersectional space. GSD: The term “artificial intelligence” gets discussed a lot, and you noted it earlier; in a way, “PULSUS” feels to me like an example of artificial intelligence. It’s a non-human organism taking information and translating it and communicating it in its own language; it’s been taught or trained to communicate. Do you in any way see “PULSUS” as an expression of artificial intelligence, or AI? SAYEGH: Actually I do. It’s a form of perceptual artificial intelligence. It makes you think that it has its own way of understanding and communicating though its actions based on a wide range of data sources. In this process, we are mining multiple large sources of data in various forms — numbers, text, emojis, audio feeds — looking at different criteria we have to work with, and designing the experience based on how the data can be interpreted. In the end, it hums and vibrates and responds to vibrations around it, all the while quietly collecting and processing what’s going on in the city. So yes, it’s perceptual AI in manifest. GSD: What are some of the general reactions you’ve had to “PULSUS” so far? SAYEGH: In a funny way it feels like some sort of a Rorschach test. People usually tend to project their current socio-political take on different issues. I’ve heard everything from references to climate change to molten political sculptures. When you put in front of someone an object that does not fit into a specific mold, it tends to bring up all sorts of interesting interpretations. 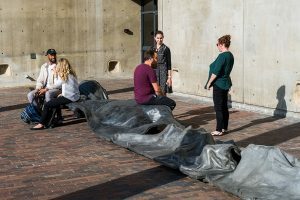 So then they experience it, they hear it, they feel it, and they end up spending a bit of time with it, which was the intention of the piece: an invitation to an experientially meditative moment. Originally published by the Harvard Gazette under a Creative Commons license. This entry was posted in Academic, Art, Education. Bookmark the permalink.